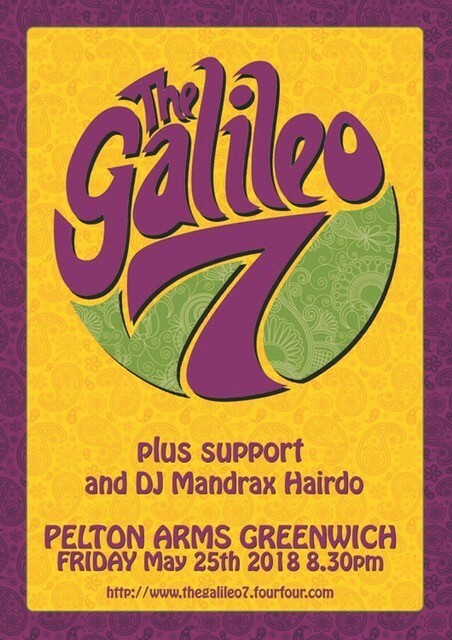 The Galileo 7 play psych-tinged, garage-flavoured, Medway-tainted power-pop and feature former Prisoner, Solarflare and current Forefather Allan Crockford (The Prisoners, The Solarflares, James Taylor Quartet, Thee Headcoat and more). All the action kicks off at 9pm with a support band followed by Galileo live on stage at 10pm and Mandrax Hairdo bring the night to a close with a DJ set from 11pm-1am. Expect psychedelic, 60s, pop, shoe gaze, experimental, soul and funk! What a night this promises to be! !